There are many reasons why you may be attracted to buying used photography equipment from an online source. The price of new equipment is prohibitive and your passion for photography won’t wait for you to save the money or win the lottery. You need a specific lens or specialized piece of equipment to shoot the kind of photos you enjoy the most. You own an older digital camera, and a certain accessory is no longer manufactured for it that you need. You may want the experience of shooting with a film camera for the first time. You’re a collector and you’d like to add a rare camera to your collection, or you know a collector and you want to give him or her a gift. The reasons you might find yourself attracted to eBay, Etsy or other Internet sites with used equipment are many and varied. Regardless of what you seek or see unexpectedly online that captures your fancy, you’re always rolling the dice that you will receive what you thought you bought. Be aware of the two types of individuals selling used photography equipment online: those that are intentionally trying to fool buyers and those that misrepresent what they are selling because they don’t know any better. You can improve your odds of being pleased with your purchase and spending your money wisely if you take your time and follow these tips. Request detailed information from the seller about where he or she acquired the equipment, from whom and how it was used. Estate sales, garage sales and flea markets are typical sources and may be entirely legitimate. What’s more telling is if the equipment is from a professional photographer, which may mean it has been treated well and/or has reached the end of its operational life. Remember, most cameras have a limited number of times the shutter can be operated. If the photographer used it for studio work, then it may have more life left in it than if it was primarily used for landscape, wildlife and nature photography and was subject to the extremes of climate and the outdoors environment. Ask for photos of the equipment. You won’t be able to handle a used camera before you buy it from an online source, so you definitely want a liberal number of photos of it to allow you to inspect it carefully. Make sure there are plenty of close-up images of the inside and outside of the equipment. Photos should never be stock images that might have originally come from the manufacturer. You can even ask the seller to include today’s newspaper front page or other time-identifying method in the photos, so you know the pictures are current. When you receive the photos, inspect them closely, and more than once. Look for what may be replacement parts, excessive wear and tear or other marks and scratches that may indicate it has had plenty, or too much, use. If you want to be truly cautious, then you can also spend money to check various databases to determine if the equipment is stolen. Since you can’t handle the equipment before buying, quiz the seller as to its operational quality. You want to know if the parts work smoothly. Ask the seller to shine a bright light through the lens to check for any scratches or oil on the aperture diaphragm. If it is a flash, then you want him or her to fire it several times to determine the recycle time. Open and close all the legs on a tripod and ask them to apply some weight to know that none of the legs slips. 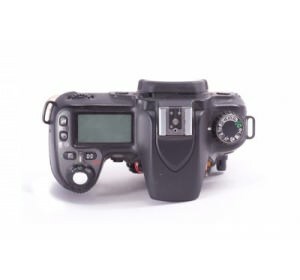 Some “legitimate” sellers may not be photographers or experienced photographers and will simply state that the shutter releases and the lens mounts and unmounts. You want to know more detail. Just because the seller hears the shutter click doesn’t mean the camera operates well. Ask the seller to take some pictures with the camera, lens and/or flash, so you can inspect them and judge whether the camera is producing quality images without distortion, dirt and other aberrations. Educate yourself about the piece of equipment you are considering buying. Inspecting pictures of the equipment won’t tell you much unless you know what it’s supposed to look like. A shiny new button or other part may not be original and was “fashioned” to work. If possible, then compare the photos with “official” photos from the manufacturer to verify it is what the seller claims. Whenever you’re in the market for used equipment, consider the smart alternative of buying only from reputable used equipment dealers, such as PhotographyTalk partner vendors, KEM and Adorama. These companies offer money-back guarantees and/or a willingness to fix any problem on used equipment to your satisfaction. It’s also very important to remember to add the used equipment to the list you’ve provided to the insurance company covering your equipment. This is particularly important if you are a collector and the item is rare and would cost considerably more than its original price to replace. PhotographyTalk recommends PackageChoice as your best partner for business protection should you suffer a loss of your valuable photography equipment. Please contact one of its experts for a free quote at http://www.packagechoice.com.